Robert Atah, a director of the Cameroon FA's technical body, has said that players and officials need to 'reconcile' for the good of the Indomitable Lions. His comments come after Cameroon lost 2-0 in Cape Verde in the first leg of the final round 2013 Africa Cup of Nations qualifying. 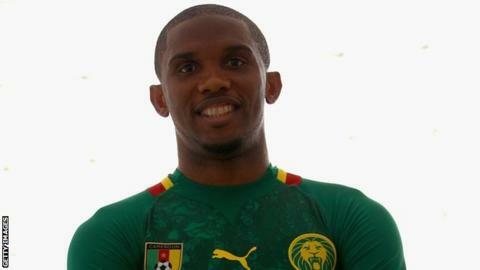 Atah traces the problems back to Samuel Eto'o being made captain while former skipper Rigobert Song was still playing. "There's a lot of internal conflicts within the players and the administration," he told BBC Sport. "That is the main problem and if this problem is not internally solved we can't expect much from our football. "The way forward is reconciliation - we know the antagonists, we know the people who are having problems. Robert Atah, a director of the Cameroon FA's technical body says there needs to be peace talks for the good of the Indomitable Lions. "It's players against players and players against executive so they must sit down and reconcile." He believes that a lot of the problems within the squad stem from when former coach Paul Le Guen made Eto'o captain. "When the captainship was transferred from Rigobert Song to Eto'o there were cliques in the squad - those supporting Eto'o' and those supporting Song," he explained. "And from there conflict began between players which has not been solved. "So we can look in the same direction - if we don't accept our mistakes there is no way forward." Eto'o refused a recall to the Cameroon squad for the match in Cape Verde following his eight-month ban for his part in a player strike last year. Marseille's Nicolas Nkoulou captained the Indomitable Lions in Praia. Cameroon now need to win by three goals in the second leg of the tie on the weekend 12-14 October if they are to qualify for the 2013 Nations Cup in South Africa. They failed to reach the finals earlier this year in Equatorial Guinea and Gabon. Meanwhile a proposed friendly between Cameroon and Egypt on 11 September in Alexandria has been cancelled due to security concerns. "The Egyptian federation has cancelled the friendly match for security reasons", a statement from the Cameroon football federation said.